Herbs and spices have been used for both culinary and medicinal purposes for centuries. Some spices were once worth their weight in gold. The use of foods for their medicinal purposes dates back hundreds of years. 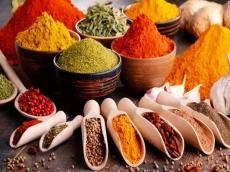 Most herbs and spices posses a number of beneficial properties and work to reduce inflammation, improve the health of your heart, boost your immune system, and even prevent and fight cancer. Savory or sweet, spices have always been valued for their ability to add flavor, color and aroma to any food. Various herbs and spices are used primarily for adding flavor and aroma to food. The more delicate herbs are often added at the end so you’ll get more of the flavor of the herb rather than a blended flavor of herbs added at the start. Spices and herbs are an inevitable part of Azerbaijani cuisine. Traditional recipes of Azerbaijani cuisine are overflow with a vast array of spices and herbs. There are some basic spices, which are used in many Azerbaijani dishes. Saffron, cumin, sumac, cardamom, as well as herbs like mint, dill, parsley, celery, basil, etc. are widely used spices in cooking. Here you will find the most commonly used herbs and spices in Azerbaijani cuisine. Azerbaijan is one of the oldest centers of saffron in the world. It was cultivated in some regions of Azerbaijan more than a thousand years ago. The most high quality sort of this spice is grown in Azerbaijan, more precisely, in Bilgah, a settlement near the capital Baku. Saffron used in the Azerbaijani cuisine was known in Asian countries 4,000 years ago. At the same time, the one which grew up in the village of Bilgya became widely known. In some of his works, prominent Azerbaijani poet Nizami Ganjavi recommended saffron as a remedy for many diseases. Saffron is the most important spice in many national dishes (pilaf, bozbash, piti, etc.). It is difficult to imagine Azerbaijani deserts halva and pakhlava without saffron. Cumin is the second most popular spice after black pepper. It is an essential spice in Azerbaijani cuisine. This delicious can be added to the first and second course dishes. It is frequently used in cooking of Azerbaijani kebab. Besides, cumin is very beneficial in promoting weight loss, improving blood sugar control and reducing food-borne infections. Basil is versatile and widely used aromatic herb. There are numerous species of basil; some have scents reminiscent of pineapple, lemon, cinnamon or cloves; others have beautiful purple leaves. Basil is sweet, slightly bitter and the perfect complement to any food. In Azerbaijan, it is added to soups, vegetable dishes from beans, peas, beans, tomatoes, spinach, sauerkraut, as well as meat and fish. Basil's health benefits include reducing inflammation, and it is said to have anti-aging and antibacterial properties. Early August is the time to harvest sumac, as rain can wash away much of the flavor and Vitamin C.
This berry-like, bracingly tart flower is composed of individual drupes, similar to the little drupes that make up the knobbed appearance of common raspberries and blackberries. About 250 species of this spice grow in Azerbaijan’s Guba, Lankaran, Goychay, Sheki and Zagatala regions. This reddish plant is an essential ingredient in the national cuisine and can be used in a variety of recipes. This delicious lemon flavored spice is often used to season meat and vegetables. Sumac sprinkled over juicy kebab and hot qutabs is must try. Antioxidants are one of the biggest health benefits of the spice. Sumac can also help normalize blood sugar levels for diabetes and pre-diabetes. Mint is widely used in cooking around the world, it is one of the most common spices, is widely used in Eastern countries. It can be added to foods in both fresh and dried forms. Mint is a popular ingredient in many foods and beverages, ranging from teas and alcoholic drinks to sauces, salads and desserts. Fresh mint brings its own distinct flavor to a number of recipes such as traditional Azerbaijani soup made of plain yogurt and herbs dovga, kebab, meatball soup kufte-bozbash, and other dishes. Its health benefits includes aiding digestion, treat dizziness, treating nausea, treating headaches, treating nasal congestion, improving dental health, enhancing the skin, promoting eye health, supporting weight loss and boosting immunity. Since ancient times, curcuma has been used in Azerbaijan. This golden spice is widely added used in national cuisine. One of the most loved spice add flavor to meat, vegetable, cereal, sweet dishes and beverages. Curcuma has powerful anti-inflammatory effects. The spice is often used for arthritis, heartburn (dyspepsia), joint pain, stomach pain, diarrhea, intestinal gas, stomach bloating, loss of appetite, etc. Cinnamon takes center stage in many desserts. Most people use cinnamon to flavor their coffee, in baked goods, and in certain savory dishes. The red-brown spice or darchin as it is called here is an inevitable part of Azerbaijani cuisine as well. Cinnamon makes the pilaf wonderfully fragrant. There is no Azerbaijani holiday, or special occasion without pilaf. Just a hint of cinnamon makes pilaf recipes (Parcha-Doshama, Fisinjan, Shashandaz) unexpectedly delicious. With its ancient history and immense health benefits, ginger has been hailed by many cultures as a spice of the heavens. Ginger can be used fresh, dried, powdered, or as an oil or juice. There are no dishes that cannot be cooked with ginger - it is added to salads, to broths, soups, mushrooms, cereals, beans and cheese. Azerbaijani people also use the healing properties of this spice. The mixture of honey and ginger is considered an excellent remedy for colds and other ailments. Ginger tea is made by boiling fresh ginger root in water. Lemon juice and honey are added to this strained liquid. Moreover, drinking a glass of ginger water every day can help strengthen your digestive system.